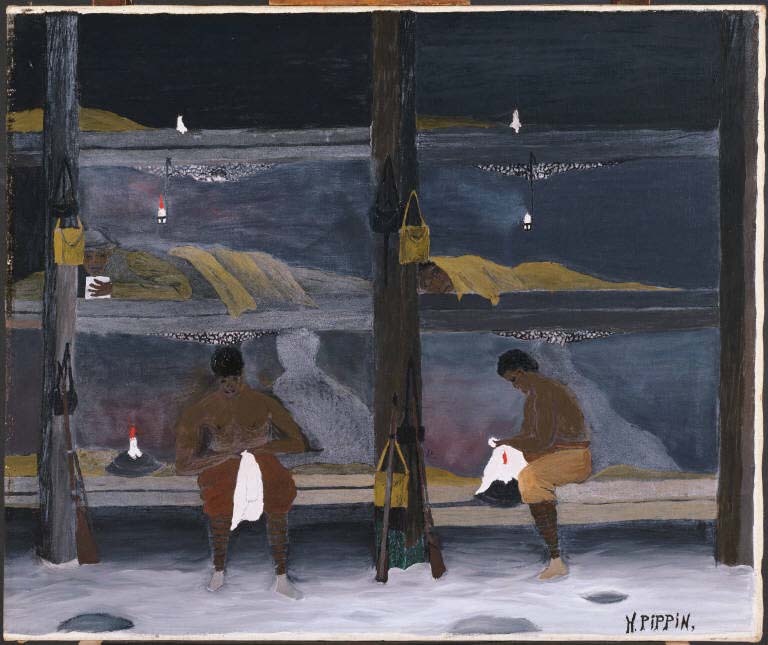 Horace Pippin, The Barracks, 1945. Oil on canvas, 25 1/4 x 30 in. The Phillips Collection, Washington, D.C. Acquired 1946. Veterans Day used to be known as Armistice Day, to recall the signing of the Armistice that formally ended World War I at the 11th hour on the 11th day of the 11th month of 1918 and to remember with gratitude all those who served. It is interesting to see how many artists in The Phillips Collection served during WWI. Georges Braque joined the French Army in 1914 and left to recuperate from a severe head wound. Raymond Duchamp-Villon enlisted in the French Army Medical Corps, got Typhoid fever in 1916, finally dying in 1918. Roger de la Fresnaye enlisted in 1914 and drew and painted watercolors of his comrades. In 1918 he got a lung hemorrhage in the trenches, ailing until he died in 1925. Franz Marc joined the German Infantry. He was deemed a notable artist and exempted from military service, but before the discharge papers could reach him he was killed by shrapnel at the Battle of Verdon in 1916. Paul Klee‘s father pulled a few strings to get him off the front lines, so Klee became a painter of camouflage on German aircraft. André Derain was drafted and served for five years. Oskar Kokoschka joined the Austria-Hungarian Army, was wounded in action, and was discharged when the doctors determined that he was mentally unstable. Harold Weston did relief work and was a painter for the British Mesopotamia Expeditionary Force.